This colour is the result of a naturally occurring, recessive mutation. "Cream", as it is usually abbreviated was the first "self" colour to arise, (since White is not, technically, a colour). The animal is not, as many people expect, the colour of cow's cream; a really good show animal might be compared instead to an apricot or peach in colour. Generally, though, most Cream hamsters are paler than this, some almost the colour of fudge or weak milky tea. Prior to the arrival of the true Black in the early 1990's, all "Self" colours in the United Kingdom included Cream in their genetic makeup, and most still do. ("Self" refers to a variety which is the same colour all over, including the belly fur. "Agouti" varieties have paler belly fur and lighter "crescents" on the side of the face). For example, Copper, Ivory, Sable and Mink hamsters are all produced by the interaction of the Cream gene, (e), with another gene or genes. Since Cream is recessive, breeding Cream to Cream will produce only Cream young, (unless another recessive colour is carried by both parents). Black Eyed Creams are probably one of the most popular colours of hamster in the UK, and, when breeding for show, it is worthwhile "shopping around" to buy stock from successful Exhibitor - Breeders. 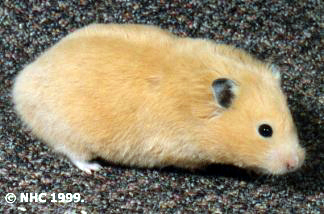 Cream hamsters also make acceptable mates for some of the rarer colours, (Copper, Ivory, etc. ), due to the gene being an integral part of the colour.